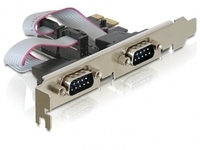 The Delock PCI Express card expands your PC by two external serial Ports. You can connect devices like scanner, modem, mouse etc. to the card.